Download "University of Brighton Sustainable Procurement Strategy 2011-2015"
1 University of Brighton Sustainable Procurement Strategy Sustainable procurement in a challenging environment Introduction There is widespread recognition that climate change and the use of dwindling resources are two of the biggest challenges facing the world today. This has led to government setting an agenda for sustainable development in the public sector for the coming years: February 2009, the Higher Education Funding Council for England (HEFCE) published an update to their Sustainable Development in Higher Education strategic statement and action plan. In relation to the goal of Sustainable Development it stated: For the UK Government and the devolved administrations, that goal will be pursued in an integrated way through a sustainable, innovative and productive economy that delivers high levels of employment; and a just society that promotes social inclusion, sustainable communities and personal well-being. This will be done in ways that protect and enhance the physical and natural environment, and use resources and energy as efficiently as possible. 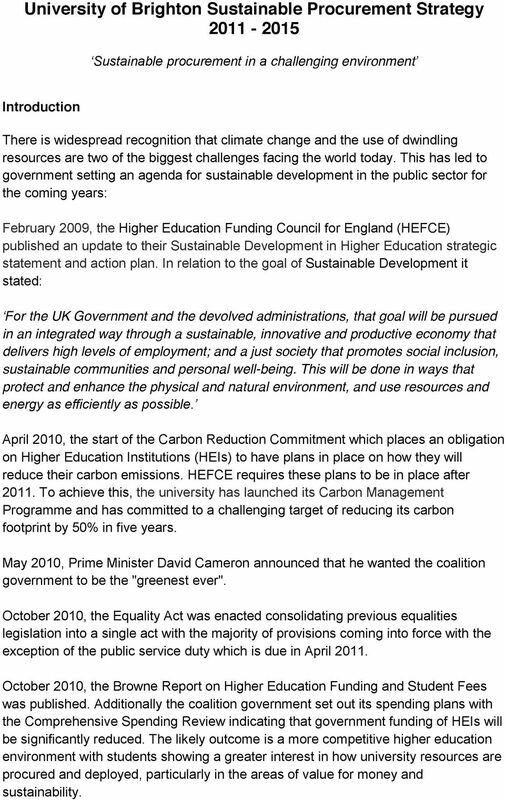 April 2010, the start of the Carbon Reduction Commitment which places an obligation on Higher Education Institutions (HEIs) to have plans in place on how they will reduce their carbon emissions. HEFCE requires these plans to be in place after To achieve this, the university has launched its Carbon Management Programme and has committed to a challenging target of reducing its carbon footprint by 50% in five years. May 2010, Prime Minister David Cameron announced that he wanted the coalition government to be the "greenest ever". October 2010, the Equality Act was enacted consolidating previous equalities legislation into a single act with the majority of provisions coming into force with the exception of the public service duty which is due in April October 2010, the Browne Report on Higher Education Funding and Student Fees was published. Additionally the coalition government set out its spending plans with the Comprehensive Spending Review indicating that government funding of HEIs will be significantly reduced. The likely outcome is a more competitive higher education environment with students showing a greater interest in how university resources are procured and deployed, particularly in the areas of value for money and sustainability. 2 October 2010, a report into public sector procurement by Sir Philip Green was published highlighting areas where greater efficiency in government spending could be achieved. These areas covered included commodity procurement, relationships with key suppliers and property portfolios. It can therefore be seen that to strengthen the University and its position for the future it is vital that its procurement policies and practices deliver the best value for the institution and are sustainable from an environmental, social and economic perspective. 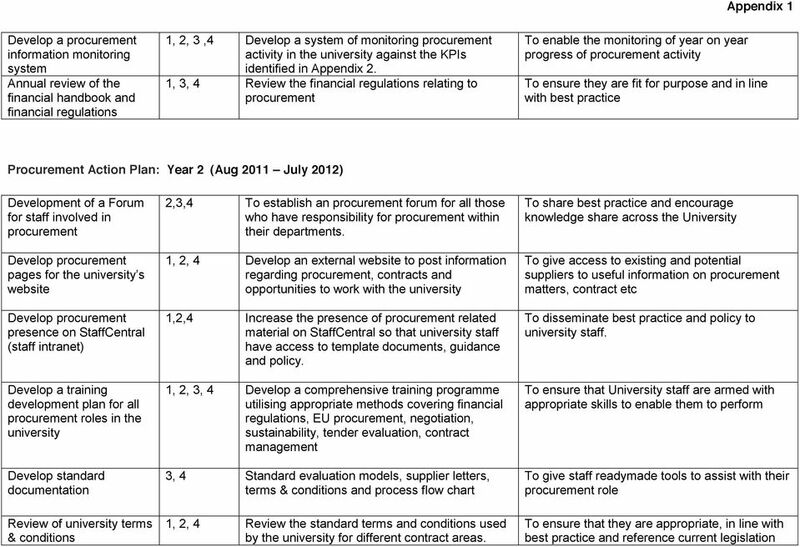 Vision This vision for procurement supports the university s Aims and Values (found in Appendix 1) and sets a clear framework for procurement throughout the University for the next four years. It is the vision that the university meets its requirements for works, supplies, services, and utilities in a way that achieves value for money on a whole life basis in terms of generating benefits to society and the economy, whilst minimising damage to the environment and providing for long term financial stability. 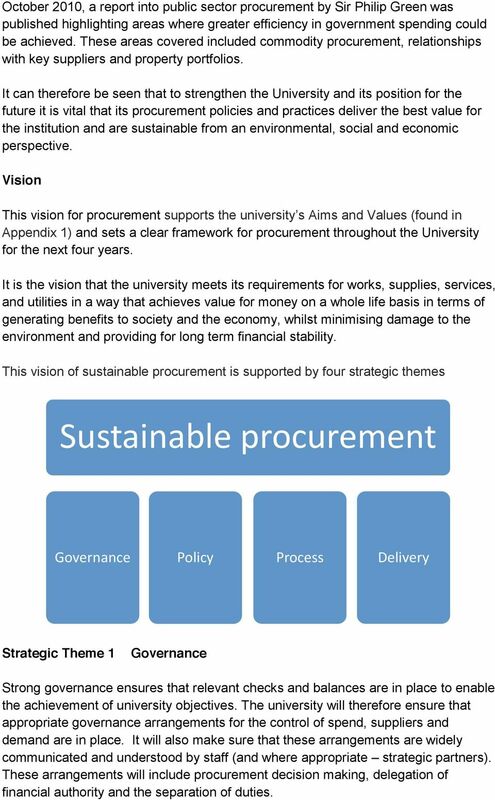 This vision of sustainable procurement is supported by four strategic themes Sustainable procurement Governance Policy Process Delivery Strategic Theme 1 Governance Strong governance ensures that relevant checks and balances are in place to enable the achievement of university objectives. The university will therefore ensure that appropriate governance arrangements for the control of spend, suppliers and demand are in place. It will also make sure that these arrangements are widely communicated and understood by staff (and where appropriate strategic partners). These arrangements will include procurement decision making, delegation of financial authority and the separation of duties. 4 This will be achieved by introducing a more structured and systematic approach to training, covering topics such as sustainability, tendering & evaluation, EU procurement and commercial negotiation. To supplement this, a Buying Community will be fostered within the university by sharing best practice across the organisation via ad-hoc forums and improved communication of procurement matters via a greater utilisation of the university s Intranet, Staff Central. Attracting the Right Suppliers To ensure that the university contracts with high quality suppliers in sufficient numbers to ensure competition, the university will make best use of communication channels with suppliers and highlight the benefits of working with the university. It will also make clear its requirements and processes and seek out ways to minimise the burden that public sector procurement can put on supplier resources. 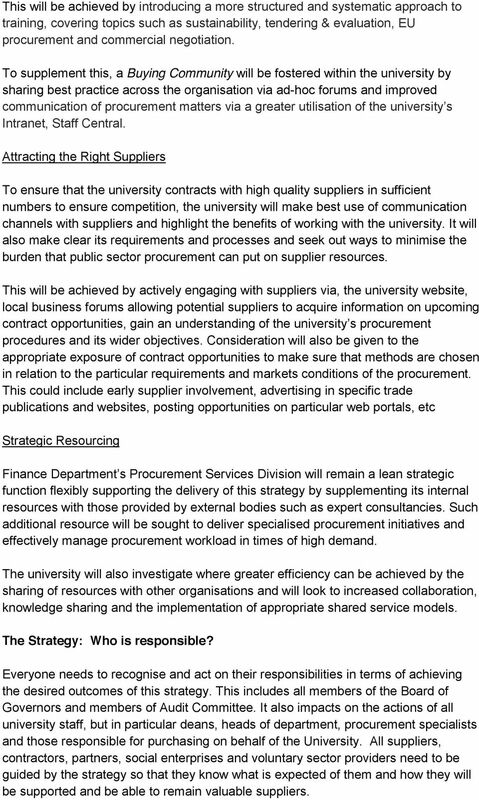 This will be achieved by actively engaging with suppliers via, the university website, local business forums allowing potential suppliers to acquire information on upcoming contract opportunities, gain an understanding of the university s procurement procedures and its wider objectives. Consideration will also be given to the appropriate exposure of contract opportunities to make sure that methods are chosen in relation to the particular requirements and markets conditions of the procurement. This could include early supplier involvement, advertising in specific trade publications and websites, posting opportunities on particular web portals, etc Strategic Resourcing Finance Department s Procurement Services Division will remain a lean strategic function flexibly supporting the delivery of this strategy by supplementing its internal resources with those provided by external bodies such as expert consultancies. Such additional resource will be sought to deliver specialised procurement initiatives and effectively manage procurement workload in times of high demand. The university will also investigate where greater efficiency can be achieved by the sharing of resources with other organisations and will look to increased collaboration, knowledge sharing and the implementation of appropriate shared service models. The Strategy: Who is responsible? Everyone needs to recognise and act on their responsibilities in terms of achieving the desired outcomes of this strategy. This includes all members of the Board of Governors and members of Audit Committee. It also impacts on the actions of all university staff, but in particular deans, heads of department, procurement specialists and those responsible for purchasing on behalf of the University. All suppliers, contractors, partners, social enterprises and voluntary sector providers need to be guided by the strategy so that they know what is expected of them and how they will be supported and be able to remain valuable suppliers. 5 How will it be achieved? The strategy will be achieved by the Finance Department s Procurement Services Division working in close partnership with the various faculties and departments and is supported by a Procurement Action Plan that sets out a specific programme of actions and initiatives to deliver this strategy. 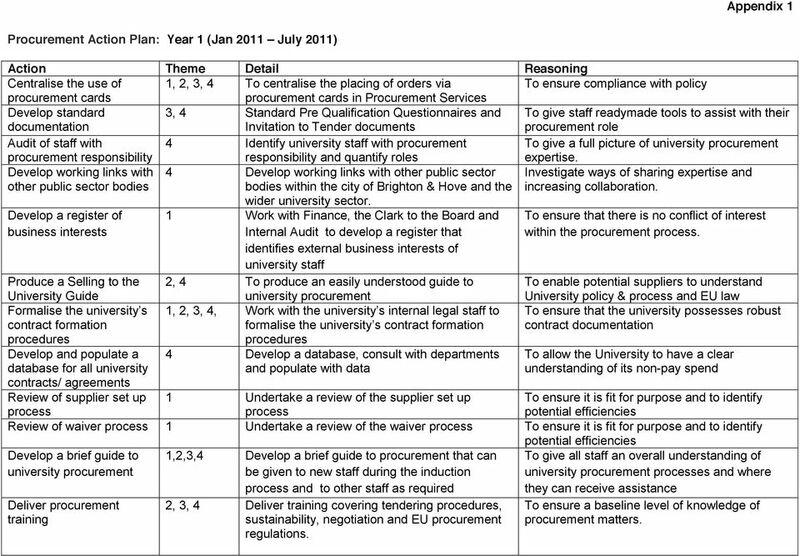 The Action Plan will be updated every 12 months and form the basis of regular monitoring (see Appendix 1). 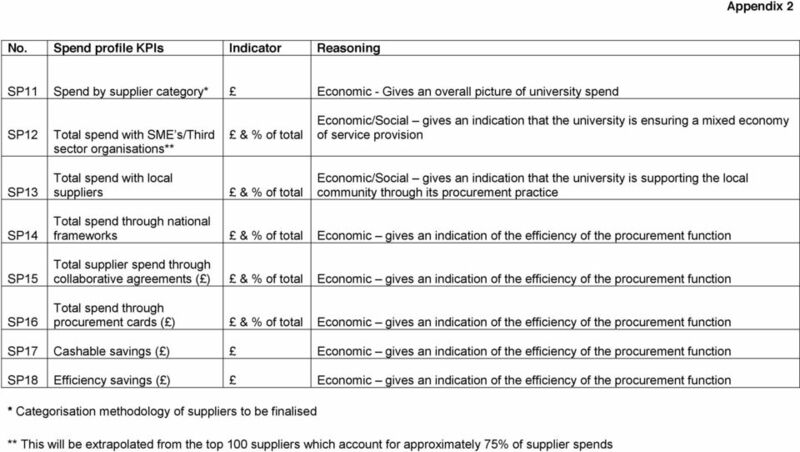 To ensure that the university does not further develop its procurement function in isolation, makes best use of best practice, seeks collaborative opportunities and reduces costs, relevant guidance and expertise will be sought form other public sector bodies including other HEIs, Local Authorities, Central Government, NHS etc Measurement of Impact Currently management information relating to procurement activity is insufficient to be able to set a meaningful baseline. 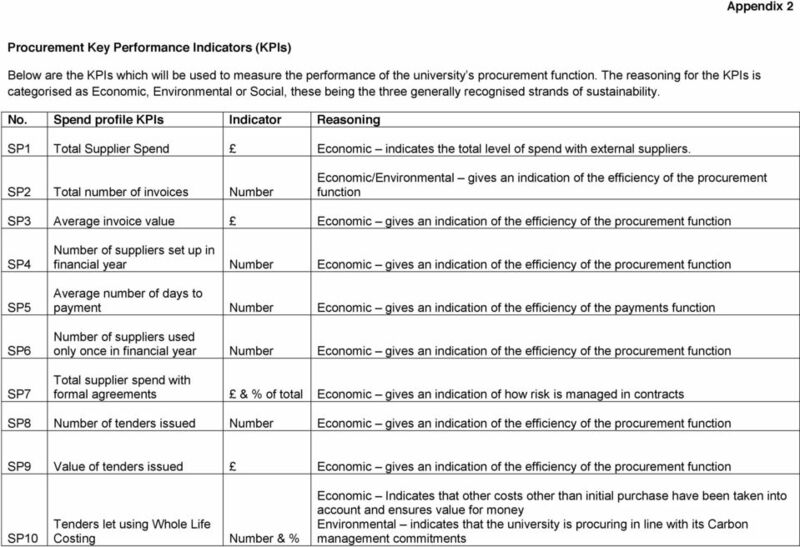 To rectify this, a basket of suitable Key Performance Indicators (KPIs) has been developed (found in Appendix 2). 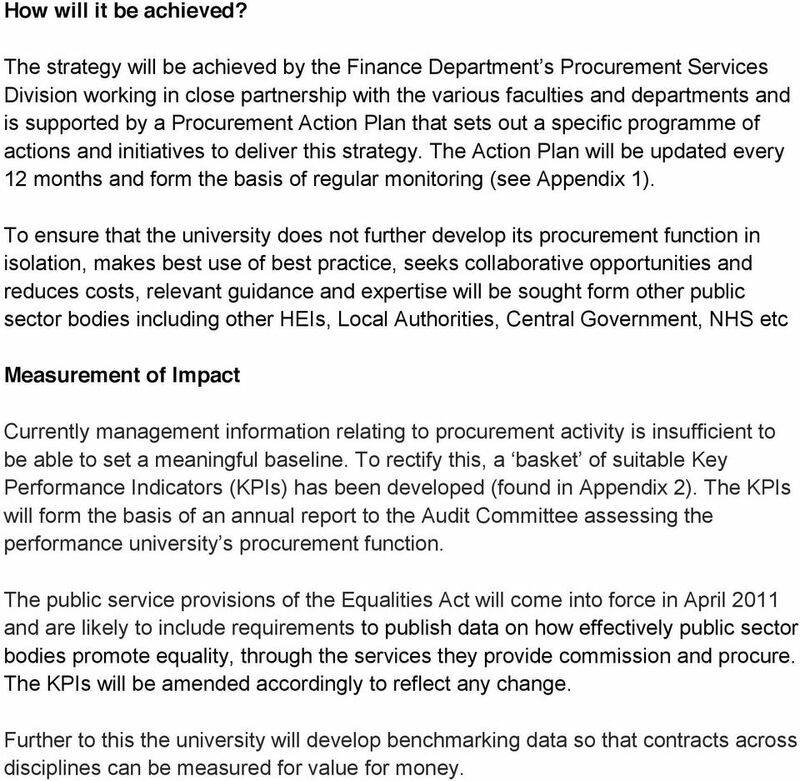 The KPIs will form the basis of an annual report to the Audit Committee assessing the performance university s procurement function. The public service provisions of the Equalities Act will come into force in April 2011 and are likely to include requirements to publish data on how effectively public sector bodies promote equality, through the services they provide commission and procure. The KPIs will be amended accordingly to reflect any change. Further to this the university will develop benchmarking data so that contracts across disciplines can be measured for value for money. 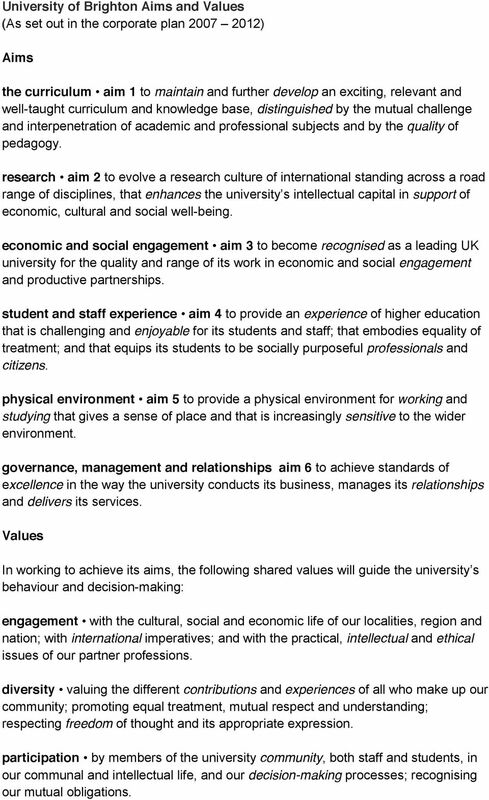 6 University of Brighton Aims and Values (As set out in the corporate plan ) Aims the curriculum aim 1 to maintain and further develop an exciting, relevant and well-taught curriculum and knowledge base, distinguished by the mutual challenge and interpenetration of academic and professional subjects and by the quality of pedagogy. research aim 2 to evolve a research culture of international standing across a road range of disciplines, that enhances the university s intellectual capital in support of economic, cultural and social well-being. economic and social engagement aim 3 to become recognised as a leading UK university for the quality and range of its work in economic and social engagement and productive partnerships. student and staff experience aim 4 to provide an experience of higher education that is challenging and enjoyable for its students and staff; that embodies equality of treatment; and that equips its students to be socially purposeful professionals and citizens. physical environment aim 5 to provide a physical environment for working and studying that gives a sense of place and that is increasingly sensitive to the wider environment. governance, management and relationships aim 6 to achieve standards of excellence in the way the university conducts its business, manages its relationships and delivers its services. Values In working to achieve its aims, the following shared values will guide the university s behaviour and decision-making: engagement with the cultural, social and economic life of our localities, region and nation; with international imperatives; and with the practical, intellectual and ethical issues of our partner professions. diversity valuing the different contributions and experiences of all who make up our community; promoting equal treatment, mutual respect and understanding; respecting freedom of thought and its appropriate expression. participation by members of the university community, both staff and students, in our communal and intellectual life, and our decision-making processes; recognising our mutual obligations. 7 collaboration being a good partner, locally, regionally, nationally and internationally; being responsive as well as proactive; delivering what we say we will do. sustainability responding to the imperative and obligations of sustainable development, financially, environmentally and educationally. 8 Appendix 1 Procurement Action Plan: Year 1 (Jan 2011 July 2011) Action Theme Detail Reasoning Centralise the use of 1, 2, 3, 4 To centralise the placing of orders via To ensure compliance with policy procurement cards procurement cards in Procurement Services Develop standard documentation 3, 4 Standard Pre Qualification Questionnaires and Invitation to Tender documents To give staff readymade tools to assist with their procurement role Audit of staff with procurement responsibility 4 Identify university staff with procurement responsibility and quantify roles To give a full picture of university procurement expertise. Develop working links with other public sector bodies 4 Develop working links with other public sector bodies within the city of Brighton & Hove and the Investigate ways of sharing expertise and increasing collaboration. Develop a register of business interests wider university sector. 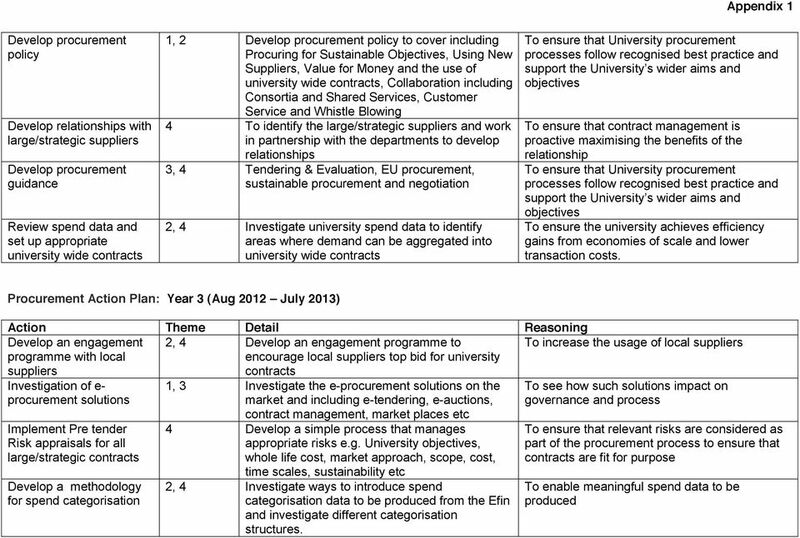 1 Work with Finance, the Clark to the Board and Internal Audit to develop a register that identifies external business interests of university staff To ensure that there is no conflict of interest within the procurement process. Produce a Selling to the University Guide 2, 4 To produce an easily understood guide to university procurement To enable potential suppliers to understand University policy & process and EU law Formalise the university s contract formation 1, 2, 3, 4, Work with the university s internal legal staff to formalise the university s contract formation To ensure that the university possesses robust contract documentation procedures procedures Develop and populate a database for all university 4 Develop a database, consult with departments and populate with data To allow the University to have a clear understanding of its non-pay spend contracts/ agreements Review of supplier set up process 1 Undertake a review of the supplier set up process To ensure it is fit for purpose and to identify potential efficiencies Review of waiver process 1 Undertake a review of the waiver process To ensure it is fit for purpose and to identify potential efficiencies Develop a brief guide to university procurement 1,2,3,4 Develop a brief guide to procurement that can be given to new staff during the induction process and to other staff as required To give all staff an overall understanding of university procurement processes and where they can receive assistance Deliver procurement training 2, 3, 4 Deliver training covering tendering procedures, sustainability, negotiation and EU procurement regulations. To ensure a baseline level of knowledge of procurement matters. 14 Appendix 2 No. Management Practice KPIs Indicator Reasoning MP1 Number of learning sessions Number Economic/Environmental/Social gives an indication that university staff are receiving continual professional development MP2 Number of attendees at learning sessions Number Economic/Environmental/Social - gives an indication that university staff are receiving continual professional development MP3 Update of Contract Database Yes/No Economic/Environmental/Social Ensures an up to date record of the university s contracts it kept MP4 Annual review of Financial Regulations Yes/No Economic/Environmental/Social Ensures that the financial regulations are fit for purpose and in line with best practice and legislation MP5 Annual review of Finance Handbook Yes/No Economic/Environmental/Social Ensures that the handbook is fit for purpose and in line with best practice and legislation MP6 Update of register of business interests Yes/No Economic ensures that the risk of undue influence on procurement is being managed Further to reporting on these quantative KPIs a narrative of procurement activity will be given highlighting the more qualitative elements of sustainable procurement activity for the financial year. 15 Appendix 2 Monitoring systems for the following set of KPIs will be developed, whilst it is recognised that strong contract management is a fundamental cornerstone of procurement efficacy the KPIs indicated may not provide suitable management information and may need further development. No. Contract Management KPIs Indicator Reasoning CM1 Number of Renewable contracts over 20,000 Number Economic/Environmental/Social - Gives an indication of how many contracts require active contract management CM2 Annual contract review Number & % Economic/Environmental/Social - Gives an indication of how many renewable contracts are actively managed Number & % CM3 Result of Review Poor Satisfactory Good Economic/Environmental/Social gives an indication of the success of the contractual relationships the university has with its suppliers Further to reporting on these KPIs a narrative of Contract Management activity will be given highlighting successes and issues arising in the financial year. Brief 21 August 2011 Public Procurement Performance Measurement C O N T E N T S What is the rationale for measuring performance in public procurement? What are the benefits of effective performance management? Procurement and contract management strategy Approved 2015 by Contents 1 Introduction...3 1.1 Purpose of procurement and contract management strategy 1.2 What is procurement? 1.3 What is contract management? Aggregation. Is bigger always better? 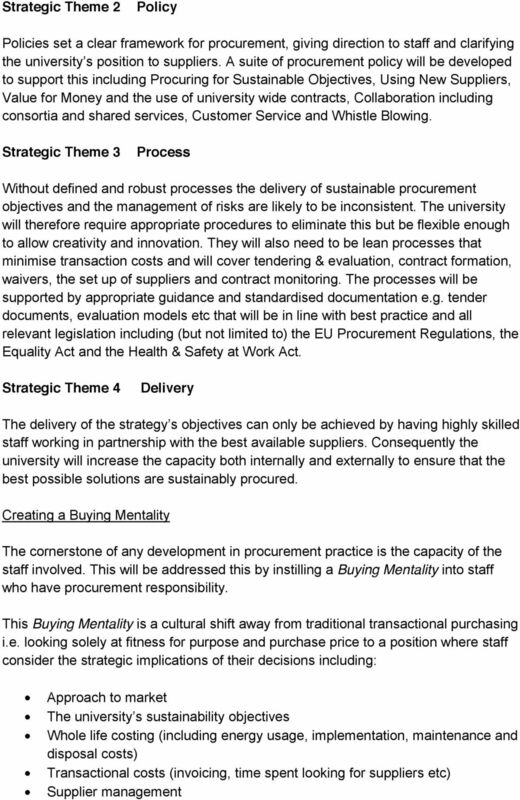 CITY OF LONDON PROCUREMENT STRATEGY MAY 2009 CONTEXT Definition Procurement is the process of acquiring goods, works and services, covering both acquisitions from third parties and from in house providers.